Law enforcement and other first responders block off an intersection during the active-shooter incident. UPDATE Saturday 4 PM: Updated information from the city says four civilians were transported to hospitals with gunshot wounds during the incident. Five law enforcement officers, four with the Colorado Springs Police Department and one from the El Paso County Sheriff's Office, were also taken to hospitals with gunshot wounds. Three additional police officers were injured. All are in good condition and expected to make full recoveries. During the incident on Friday, 24 people were evacuated from the Planned Parenthood building unharmed. 300 were sheltering in place at surrounding businesses. Authorities say the names of the two civilians killed will not be released until after autopsies are conducted and relatives notified. Autopsies are scheduled for Monday. Dear is from Hartsel, but has ties to North Carolina. A court appearance is scheduled for Monday. The investigation involves multiple local, state, and federal agencies. UCCS held moments of silence prior to two basketball games today to honor Officer Garrett Swasey. A candlelight vigil is planned for 7:30 PM at the university. 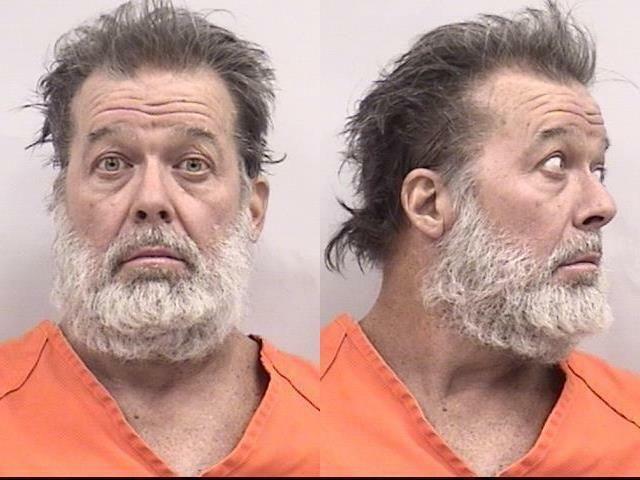 Robert Lewis Dear was arrested after an hours-long standoff at a Planned Parenthood clinic in Colorado Springs. UPDATE: The suspect has been identified as 57-year-old Robert Lewis Dear. Dear was booked into the El Paso County Criminal Justice Center. 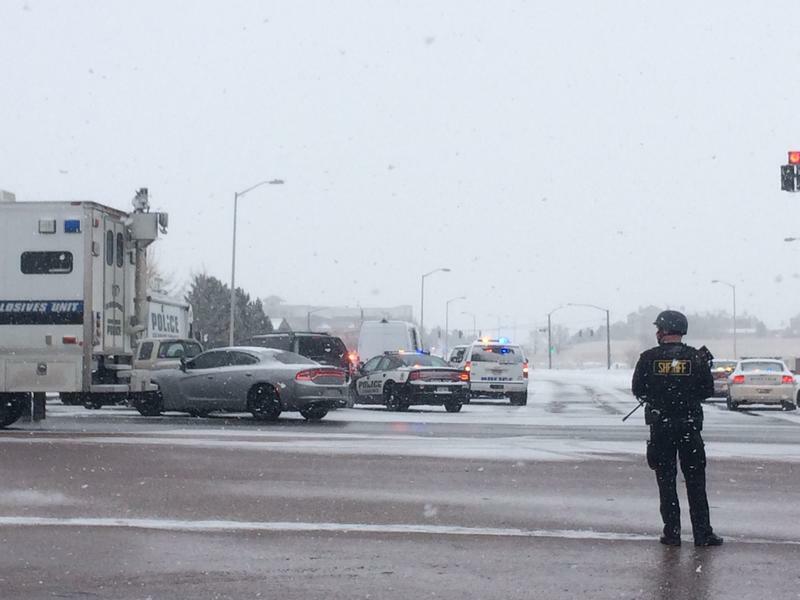 The Colorado Springs Police Department is confirming that the "items" brought to the scene by the gunman have been "secured and processed... and no longer a threat." Fillmore is now open; portions of Centennial remain closed. 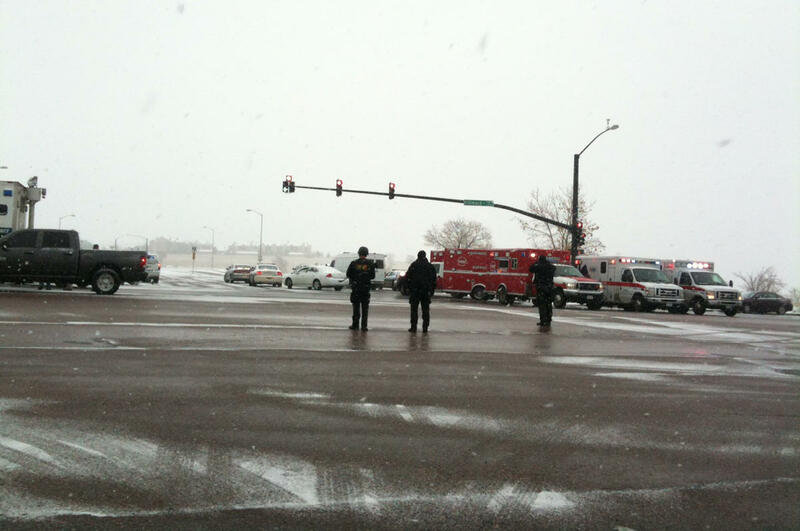 ORIGINAL POST: Three are dead and nine more hospitalized after an hours-long standoff with a gunman inside a Planned Parenthood clinic on Colorado Springs' northwest side. Among the dead are two civilians and a police officer with the University of Colorado-Colorado Springs. 44-year-old Officer Garrett Swasey, a six-year veteran of the UCCS Police Department, was on duty at the campus and responded in support of the Colorado Springs Police Department. The civilians have not yet been identified. 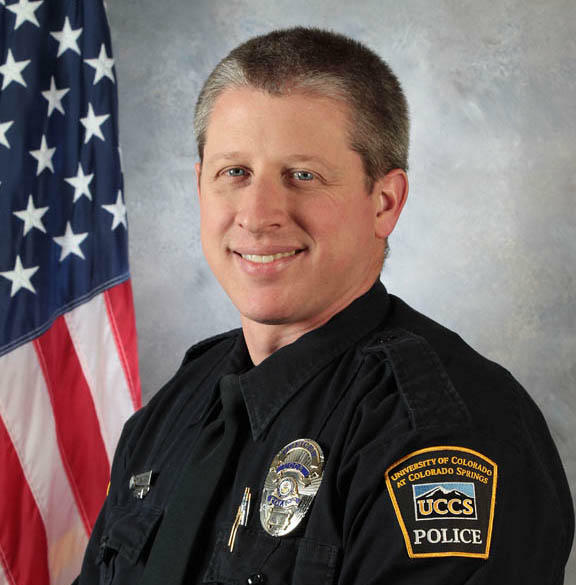 Officer Garrett Swasey of the UCCS Police Department is among the confirmed dead. 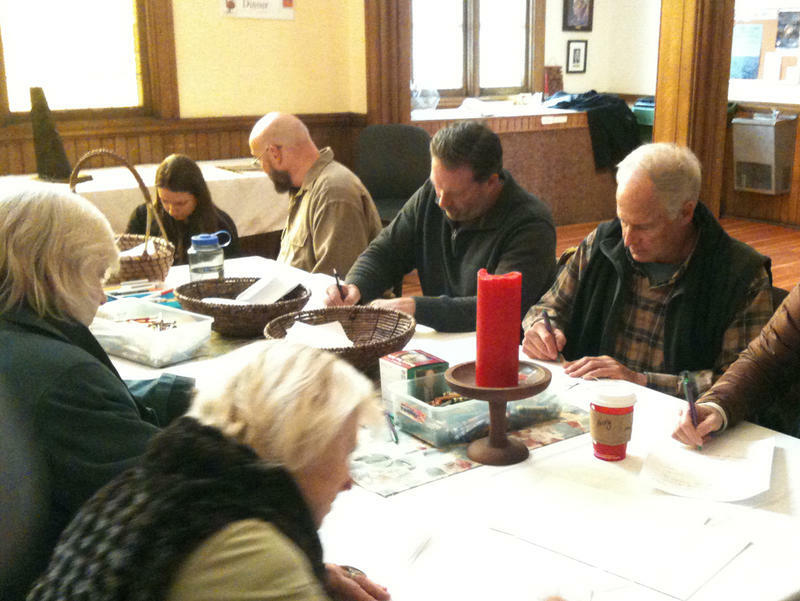 Swasey was responding in support of the Colorado Springs Police Department. The nine hospitalized include gun shot wounds to four civilians and five officers, who as of Friday night, were considered in good condition, according to Colorado Springs Police Department spokeswoman Lieutenant Catherine Buckley. The incident began shortly before noon Friday at the Planned Parenthood clinic on Centennial, between Garden of the Gods Road and Fillmore. At a press conference, Colorado Springs Police Chief Pete Carey said he was able to spend time with the hospitalized. "My heart's broken," he said. "This is a really really tough situation for a lot of people in our community, and the community at large." Colorado Springs Mayor John Suthers expressed sympathy to loved ones of the victims, and called it a "terrible terrible tragedy." Suthers also praised the efforts of first responders. "They were able to get people out of the building safely, and they were able to make sure that the perpetrator was isolated in a place where there could be communication back and forth about where he was. I'm absolutely certain that the result of that was that some people who otherwise would have been victimized were able to get out of that building safely." As late as 4 PM, Colorado Springs Police Department spokeswoman Lieutenant Catherine Buckley said law enforcement had not been in voice contact with the suspect. "We know that we're in contact with him, because he has shot at our officers," said Buckley. The shooter was in custody shortly before 5 PM. "That individual has been transported away from the scene, and obviously we're going to start our investigation from there," said Lt. Buckley. Buckley said officers inside the building were able to shout at the suspect, and get him to surrender. The suspect has not been identified. Buckley said it will likely take days to process the scene, and that it's too early to speculate as to motive. Nearby businesses, including a large grocery store, were on shelter-in-place protocols. Buckley said the suspect had brought "items" with him, and law enforcement was working to establish what those items were, and what danger they may present. "I know that our officers acted with untold valor to make sure that individuals were safely taken out of the Planned Parenthood building," said Buckley. "We also had officers that immediately responded to the surrounding businesses and they made sure that people received any type of medical aid and they were safe in those surrounding businesses." Multiple law enforcement agencies were noted as being on-scene: the Colorado Springs Police Department, El Paso County Sheriff's Department, UCCS Police Department, FBI, Colorado Bureau of Investigations, ATF (Federal Bureau of Alcohol, Tobacco, Firearms and Explosives), as well as regional explosives units and victim advocates. As required by state law, the Sheriff's Department will be investigating the shootings involving Colorado Springs Police, while the Colorado Springs Police Department is expected to investigate the originating incident. Vigils are being held in Colorado Springs Saturday for the victims of Friday's shootout at the Planned Parenthood clinic on the city's northwest side. Governor John Hickenlooper has ordered flags lowered to half-staff until further notice. Three were killed Friday as a gunman holed up in the clinic for hours. Among the dead are two civilians, and Officer Garrett Swasey, a six-year veteran of the police department at the University of Colorado at Colorado Springs. 44-year-old Officer Garrett Swasey has been identified as the police officer killed in today's incident. Swasey was a six-year veteran of the UCCS Police Department, and was responding in support of the Colorado Springs Police Department. UPDATE: 7:00 PM MST: Colorado Springs police are confirming three fatalities, two civilians and one police officer from UCCS. Four other civilians and five officers are in the hospital in "good condition."